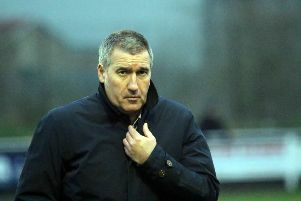 Brackley Town manager Kevin Wilkin expects more of his side this season and that’s why he was disappointed not to have ended Salford City’s unbeaten home record. A first ever trip to Salford was always going to be a highlight on Saints supporters’ calendar and a good following made the journey north for Saturday’s National League North clash. But the abiding memory of the day was neither the atmospheric old Moor Lane ground as featured so widely on TV nor the inevitable star dust sprinkled by the presence of Old Trafford legends Gary Neville and Paul Scholes. More telling was the frustration of Wilkin following Saturday’s 1-1 draw. Unbeaten at home and one place and two points above Saints in the table, Salford will not lose many home games. So a draw would be seen by many as a creditable result but Wilkin always demands more of his players and a point was not enough. Wilkin said: “I’m disappointed, it was a game we should have won. We had the chances but did not make them count, we did enough to take all the spoils. “They are unbeaten and there is a bit of a buzz around because of the [Manchester] United connection and they had a good crowd in but we managed the game well. “We dealt with most of what they threw at us. As a team we have progressed but not in all areas.